On Wednesday, Microsoft's Japanese arm revealed that on June 6 the Surface Pro tablet will finally be available in the land of the rising sun. The fondleslab is set to arrive in two different trims with 128 GB and 256 GB of internal storage, the latter of which is offered for the first time on the Surface Pro. The 64 GB Surface Pro will not be available in the local market, likely due to the fact that users can access just 23 GB of storage (practically less than half of the advertised capacity). Microsoft took heavy fire for this caveat, which it appears to avoid in Japan. Prospective buyers can also grab Touch Covers with different design themes, a move that the company carried over from other supported markets. The Surface Pro sold in the land of the rising sun also comes with Office Home and Business 2013, which includes Word, Excel, PowerPoint, OneNote and Outlook. This provides a significant differentiating factor over similar offerings which either come with less-capable third-party office suites or none at all. The rest of the specifications are carried over from the international version. The Surface Pro comes with the 64-bit Windows 8 Pro; 10.6-inch ClearType multitouch display with a resolution of 1920 by 1080; third generation Intel Core i5 processor; Intel HD Graphics 4000 GPU (Graphics Processing Unit); 4 GB of RAM; 42 Wh battery; 720p cameras on the front and rear; USB 3.0 port; microSDXC card slot; Wi-Fi 802.11 a/b/n; Bluetooth 4.0 and pressure-sensitive stylus. The fondleslab comes in at 275 x 173 x 14 mm and 907 grams. 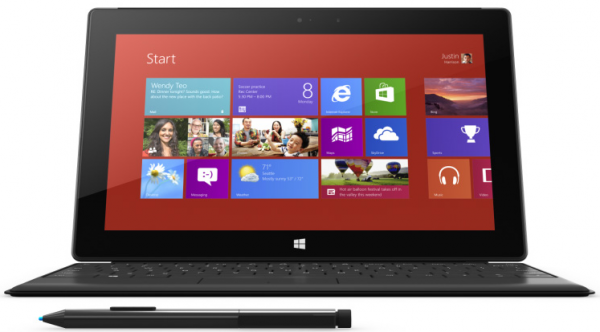 In Japan, the 128 GB Surface Pro runs for JPY99,800, which equates to roughly $985. That's less than what Microsoft charges for the 128 GB version in the US (available for $999). The software giant has yet to announce pricing for the 256 GB model in the local Asian market.